On Saturday, I had a lovely day sniffing with a group of perfumistas in DC. March has already covered the proceedings on Perfume Posse, so I'm just going to highlight a few things I hadn't smelled before. 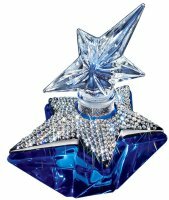 The star of the day (pardon the pun) for me was the limited edition Thierry Mugler Angel La Part des Anges. I am most emphatically not an Angel fan, but this was incredibly compelling — I walked around with the test strip glued to my nose for some time. I wanted to drink it as much as I wanted to smell it, fittingly enough given that it was developed with the Rémy Martin cognac house. I can't do anything like a proper review as I didn't try it on skin (and of course could not get a sample) but I should think this is a must-smell for Angel fans, or even Angel almost-fans. It is sweet and fruity over beautifully deep, mellow wood, and vaguely reminiscent of some of the fruity woods scents by Serge Lutens. Like March, I was intrigued by Jil Sander's Stylessence. I got a sample of that one and will give it a proper trial later. Frederic Malle's Outrageous got a quick airing last night. I did not hate it so much as some reviewers have, but nor did I love it. It is just a pleasant stylised orange blossom over woody musk, very clean and fresh, very wearable. If I had smelled it blind, I never would have pegged it as a Frederic Malle fragrance, much less a Sophia Grojsman fragrance. It doesn't seem likely to attract your hard-core Frederic Malle fans, but I don't suppose that was the point. March is right on target with the bottle: it is ugly. The only thing that tempted me to part with my money was a lovely Annick Goutal coffret at Saks. I can't find it online, unfortunately, but it includes little square bottles of Mandragore, Eau d'Hadrien and Les Nuits d'Hadrien. It was $150, and since all I really wanted was the Mandragore, I let it go. Many thanks to Nancy (of The Perfumed Court) and Louise, who organized the day. If you smelled anything great over the weekend, do comment! The Angel parfum still smells like Angel to me, and therefore can never touch my skin. I think I was the only one in the group to try the Outrageous on skin – really liked the clean orange blossom and citrus of the first few minutes, but when the laundry smell became prominant it because a scubber for me – cryin' shame. The only new thing for me that is potential love was the Prada Iris. I wish I had tried the Angel on skin, but didn't want it on my coat for the rest of the weekend so didn't. Oh well. Waited til I got my sample of Outrageous home for the same reason. It wasn't a scrubber for me at all — I find it “nice”, just not “wow”, and certainly not “outrageous”. It is one of those scents where the name seems to do it a disservice — nobody is going to find it outrageous, unless in the sense you did, e.g. a scrubber. When looking at this bottle, I can't help but thinking of Elvis and his suits. “Stars and stripes forever” also crosses my mind. This bottle distracts me from what is inside. It'd better be magical and good. Robin, if you couldn't take the test strip away from your nose, then this fragrance has to be good! It does look like a bottle that Elvis would love! I have not tried Coriolan. And unlike you, knowing that it is d/c makes me less tempted to try it, LOL…unless you tell me it is perfection, in which case I might. I just read the description on the NM web site….they sure don't say anything that would make you want to buy it….something about childhood and cotton candy. Still, your review makes me want to sniff it. Well, you know, that is supposed to be Angel, childhood and cotton candy, but to me it is only that in the most abstract way, unlike say, Pink Sugar, which is very nearly the real thing. This is much smoother than Angel. I'm not sure I'd find it “wearable” since I don't find the regular Angel wearable, but I'd love to have the bottle. I did try the Angel extrait on skin and I have to say, as a diehard Angel hater, I liked it. It was like the cousin of Angel who shares the same DNA but ultimately is much nicer and pleasant to be around, and does not overstay its welcome. As it wore on, it became smokier and almost tobacco-like, and then was completely gone before the end of the evening. (This, unlike the original Angel EDP, which once lasted 2 days on my wrist until it finally expired.) But especially at that price, it's really not something I could see myself ever wanting to wear again. Now if they'd only had a bottle of Joy parfum smaller than 1/2oz, I'd have been more than happy to show them my Visa card. Ah well. I ended up having to go back to the Saks the next morning because they had sold me Arpege EDP instead of Arpege parfum, darn it! I should have known the real deal would be more than $75. It was great meeting you and everyone there, and my hats off to Nancy and Louise for a wonderful event! Great to meet you too, and so sorry about your Saks mix-up, what a pain! But that would have been an amazing price. Now I'm very tempted to go back to Bloomies (my local one, that is) and try the Angel LPDA on skin, that just sounds lovely. Gone by the end of the evening wouldn't bother me a bit. According to a Guerlain fan page, Coriolan is slated to be re-released in January 2008 in Les Parisiennes series (the 125ml bee bottles). Price will likely be 140 euros like the rest of the series. Thanks — have not been paying much attention to the relaunch schedule at Guerlain. Hey kids! Sorry I missed this. Have been up to my eyeball in work and travel and just now getting re-acquainted with this Web and Internet thingy. Hope you are all doing well. Hey — you've been cooking too, I saw that apple tart! It looked unreal. I want one. The Angel Parfum was kept in cherry wood barrels for 12 weeks to let it “age.” This has really helped to bring out a sweet less oriental version of Angel. I love the scentt! I don't love the bottle. How can one go from the incredibly beautiful limited edition purple Mystic Star parfum from 2 years ago to this? I am VERY pleased to write that I am a proud owner of La Part des Anges. I think the smell is true to the original Angel – but it is softer and you can definitely smell hints of fruit and wood. I wish I could buy more than 10ml! Hopefully there is a big enough out cry that TM will contemplate producing this perfume on a larger scale. The limited edition bottle is NOT to go unmentioned either – it's beautiful! I personally was more of an “Alien” fan over “Angel” – until this .. La Part des Anges – is truly a magnificent scent worth every shiny penny! I have it too, and I smelled more chocolate in this…but truly beautiful. Ok, this isn't about Angel La Parte des Anges, but about Angel itself… I hate this perfume! It's the sickliest, grossest, most dishumanely sweet thing I've EVER tried on, to the point where I can't even stand next to a person who's got it on!!! I used to hate Angel too but if put on sparingly, it really dries down nicely.